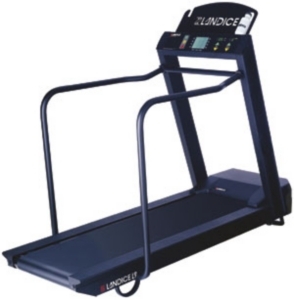 The Landice L9 Club ProSports Trainer is very similar to the L8 series in terms of features and quality, which is to say it’s an excellent treadmill. There are some minor differences that account for the slight markup to $4,550. Only you can decide which Landice treadmill is best for you. The difference lies in the number of programs offered (the L9 Club ProSports Trainer offers 3 pre-set programs and 2 user defined programs, less than the L870 Home ProSports) and in the warranty. 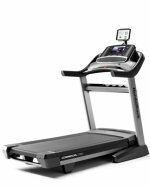 Be aware that the L9 Club ProSports trainer is considered a commercial grade treadmill, so the lifetime warranty that Landice offers on in-home machines doesn’t apply. Instead, you will get a full five year warranty on all parts with one year on labor. Keep in mind that this takes into account that Landice assumes the machine is going to get about 5-8 hours of use a day, so the treadmill warranty should last well beyond that for home use. For gyms this treadmill is one of the best and most favored models going. It’s designed for whisper-quiet operation and supreme comfort being used for hours a day and it delivers. The most talked about feature on the Landice L9 Club ProSports trainer is the Baldor motor – you just can’t find a better motor out there, and it purrs like a kitten. Owners, as always, love owning a Landice, although a few do mention that they may have over-purchased getting a Club model, since they don’t use it nearly enough to really appreciate its professional gym tolerances. Do you need the might of the Landice L9 Club ProSports trainer? That really hinges on how much of a beating your treadmill is going to take over the next several years and how long it will run each day. If you have multiple users, it might be worth it, especially if you’re all in serious training mode. Because this is a commercial grade treadmill, you might also find yourself with a 220 V machine and only 110 V outlets in your home! Be sure when you order that you specify that you want a 110 V model. But then, why are you paying for commercial grade if you’re then downgrading the voltage to standard home use? Since any Landice is exceptional, we suggest that the Landice L9 Club ProSports trainer and the entire Club series (their light commercial treadmills) may be slight overkill for the average person.